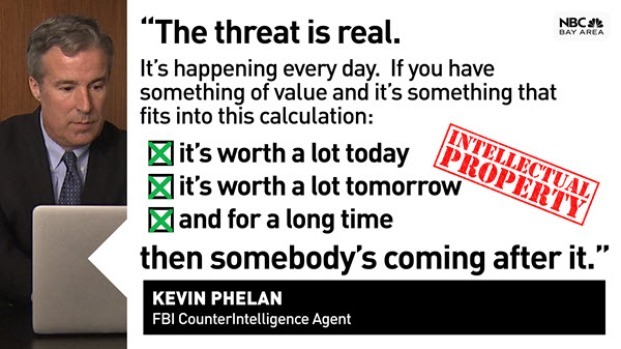 United States counterintelligence officials say an emerging threat to national security could wreck entire portions of the nation’s economy and currently poses as big or bigger threat to the country as foreign terrorism. Just the latest example of this threat: the indictment last month of a Chinese Apple engineer accused of trying to swipe trade secrets related to the company’s self-driving vehicle program. The case, say federal officials, is just the latest in what’s become a steady stream of intellectual property theft, mostly based in Silicon Valley. And U.S. intelligence officials warn that American companies and universities are sitting ducks against the government of the People’s Republic of China, which is willing to throw its full weight behind the effort to steal coveted technology to help drive its economy. The yearly cost of this threat, according to a 2017 report to Congress: Upwards of $600 billion in losses of intellectual property rights each year. And that’s just what’s reported to authorities. “What we’ve seen is the Chinese taking the same intelligence organizations, the same techniques, the same tools that they and other countries have developed over the centuries to spy on one another and applying them to commercial espionage,” said John Demers, assistant attorney general for the National Security Division of the U.S. Department of Justice. The U.S. Justice Department announced a new plan in November to thwart economic espionage and the pilfering of American trade secrets following indictments against a handful of individuals and companies accused of conspiring to steal semi-conductor company Micron’s intellectual property. Assistant AG Demers points to that case in particular as a an example of the US Government successfully fighting foreign economic espionage because multiple executive branches of the government played a role. Despite the successes, the fight against foreign spies stealing intellectual secrets from American business has intensified of late. 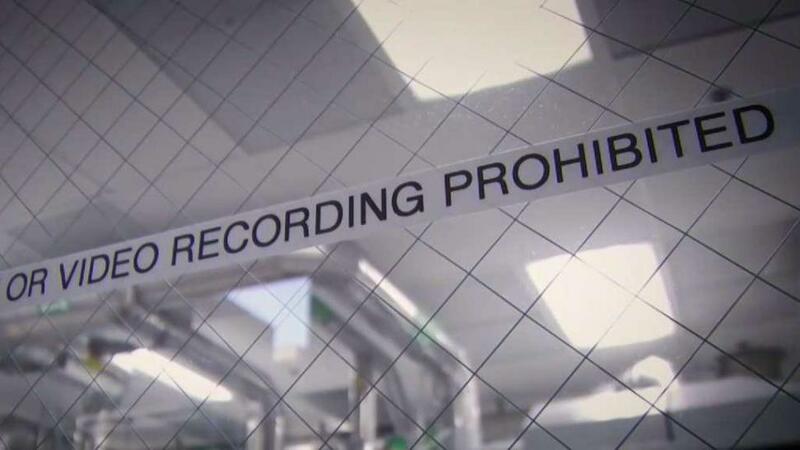 An NBC Bay Area analysis of all US District Court records dating back two decades found economic espionage and theft of trade secrets cases in court are rising sharply. Indictments on those charges are up 45 percent in the past five years compared to the five years prior, NBC Bay Area’s Investigative Unit found. China's Foreign Ministry in December called accusations of economic espionage from the U.S. "slanderous." China, intelligence officials say, has an official strategic plan called “China 2025” where government leaders have decided that there are 10 key groups of technologies and industries where they, the PRC, want to have significant domestic capability. Part of that plan, US Justice Department officials tell NBC Bay Area, involves prying technological secrets from American companies rather than developing the technologies and capabilities themselves through research and development. “It’s easier and way cheaper and a lot faster” to steal, Demers said. Demers described it as the Chinese taking a “Rob, Replicate and Replace” approach to help propel their economy. Demers said 90% of trade secret theft from the US can be traced to China, and no company, no matter how large, is immune from the threat. NBC Bay Area found thatthe brunt of China’s efforts seems to be focused on the crown jewels of American technology – researched, developed, and closely guarded here in Silicon Valley. According to the court records NBC Bay Area analysed Silicon Valley powerhouses such as Apple, Genentech, Cisco, and Intel have all been victimized—made targets of intellectual property theft. Assistant special agent in charge of counterintelligence at the FBI’s San Francisco field office, Craig Fair, said the private sector needs to do a better job of guarding those secrets and report any issues to the authorities. Fair, who, in his role at head of counterintelligence, oversees a secret Bay Area office that, alone, handles 70 percent of the nation’s economic espionage cases. Fair says China’s “whole society” approach to economic espionage makes it especially difficult to stop. Federal officials admit that Silicon Valley companies are sometimes reticent to report or publicize the theft of trade secrets because they’re afraid of angering China, where they have manufacturing plants and millions of potential customers. Several government sources tell NBC Bay Area that many economic espionage cases quietly go away without the public ever hearing about them. But some companies do cooperate and are aggressive in fighting intellectual property theft directly. In one high profile example last year, the Silicon Valley high tech lighting company Lumileds won a $66 million civil lawsuit against Chinese competitor Elec-Tech International (ETI). The jury concluded that former Lumileds employees stole trade secrets on behalf of ETI, which used those secrets to develop its own LED technology. Beyond the economic impact, Adams worries what the theft of Silicon Valley trade secrets means to national security in the future. Another fascinating recent economic espionage case was based in Oakland. On a quiet, tree-lined street near downtown, U.S. counterintelligence agents say a spy ring for the PRC used a P.O. box inside a UPS store as a front for operations. According to court records, the lead spy, a man named Walter Liew, lived in a non-descript house in the hills of Orinda, and stashed his stolen secrets in a safety deposit box in a Bank of China branch at 9th and Franklin in Oakland. In this case, FBI Counterintelligence Agent Kevin Phelan said those secrets belonged to DuPont Chemical. Phelan said DuPont spent decades and millions of dollars developing a powder called Titanium Dioxide, or the secret process for creating the color white. “They make the white things the whitest and the highest quality,” Phelan said. The DuPont stolen secrets case is still ongoing. The U.S. government last fall charged four Chinese companies with economic espionage in connection with the case after winning criminal convictions against Walter Liew and others charged in the case in 2012. During an October, 2018, hearing on the new charges against the four Chinese companies in Oakland’s federal court, attorneys representing those companies declined to comment on the case. Walter Liew was convicted and is now serving time in federal prison. A Federal Appeals Court upheld his conviction. Phelan, who now works in Paris, says the theft of these secrets threaten the nation’s security by potentially devastating entire sections of the U.S. economy if the spies succeed in stealing the wrong secrets. “It’s being able to protect jobs that people have in Silicon Valley, to protect companies, to protect the banks and the venture capitalists to fund these companies,” Phelan said. And it’s not just Silicon Valley. In some cases, the economy of entire small towns in middle America are threatened. “It means jobs” there, Phelan said. “In this case, it means entire towns in places like Delaware and Mississippi, in Tennessee. In the town of New Johnsonville, Tennessee, population 1,951, The Company Chemours, formerly DuPont, employs about 1,000 people at the largest plant in the world manufacturing Titanium Dioxide – the color white. The town’s mayor, David Cagle, once worked at the plant and worries about the town’s future if the secret Titanium Dioxide formula stolen by China someday makes the Chemours plant obsolete. US counterintelligence officials say an emerging threat to national security could wreck entire portions of the nation’s economy and currently poses as big or bigger threat to the country as foreign terrorism. Just the latest example of this threat: the indictment last month of a Chinese Apple engineer accused of trying to swipe trade secrets related to the company’s self-driving car program. The case, say federal officials, is just the latest in what’s become a steady stream of intellectual property theft, mostly based in Silicon Valley. And U.S. intelligence officials warn that American companies and universities are sitting ducks against the government of the People’s Republic of China which is willing to throw its full weight behind the effort to steal coveted technology to help drive its economy.